It was unfortunate to have woken up so late on Sunday - courtesy of drinking a lot at the party, and not getting to sleep until after 3am - because Xavier Dolan's new film Laurence Anyways, our scheduled screening at 10.15am that morning, was apparently very good. Cam made it to the screening and rubbed in this fact later. Sam and I decided to have a relaxing day, walk around and perhaps indulge in some shopping. We called into the Melbourne Central mall, wandered around Southbank, and I took Sam to the ACMI Store where she presumably made some purchases. After lunch, we wandered through Myer and along Bourke Street before returning to the GU at 3.30pm, meeting up with Cam, and getting in line for our screening of The Hunt. 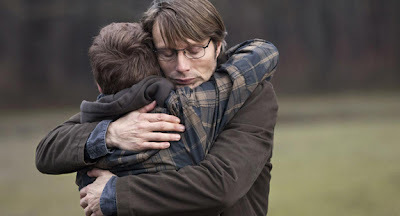 In Danish director Thomas Vinterberg's haunting new drama, The Hunt, Mads Mikkelsen (awarded the award for Best Actor at Cannes), stars as Lucas, a popular small town Kindergarten teacher. When Klara (Annika Wedderkopp), one of his closest students and the daughter of his best friend Theo (Thomas Bo Larsen), tells a story detailing inappropriate sexual contact from Lucas, it quickly becomes a serious case. The adults, informed by the school's principal despite there being no proof beyond Klara's account, are blinded by rage, turn against Lucas and begin a campaign to ensure that justice is served, targeting not only his professional career and personal reputation, but also his family. Lucas is wrongfully accused, but when more stories of abuse surface - a result of insular paranoia - the mounting lies spiral out of control to the point where the life of this innocent man is facing ruin. The Hunt is a truly affecting film. It frequently made me angry - courtesy of the decision-making by the adult characters - and I left the cinema feeling devastated. Vinterberg, perhaps best known for his Dogma 95 film The Celebration (1998) and Submario (2010), has crafted an unnerving, atmospheric and tense drama of an insular community embroiled in hysteria and turmoil as a result of a child's lie. The desire to protect your child and bring justice to a wrongdoer in a situation like this is only natural, but the series of events in this story hit me hard. Vinterberg makes wonderful use of Mikkelsen's emotive face, drawing a mesmerising performance from one of Europe's most talented performers, in this glamorously photographed work. There are many outstanding sequences - including a stunning finale - which punctuate why The Hunt is a must see, and many questionable decisions made by the school and the townsfolk, that will leave a viewer audibly frustrated. Lucas, so close to Klara's father he's like an extended member of the family, walks Klara to school alone on one occasion and on another assists a child in the lavatory. While these seem like kind and harmless gestures, without alternative adult supervision Lucas is susceptible to a situation like the one he is accused of. He has no witnesses, so it becomes the child's word against his. Following the emotionally draining The Hunt Sam, Cam and I looked for a spot for dinner. We returned to the restaurant part of the bustling bar we visited on Friday night. I ordered fish and chips and we discussed the film. There was lots to discuss. Then we went searching for a coffee to keep us awake - so tired now - before meeting up with the MIFF gang for an arranged assembly in the Forum Lounge. Here we ran into (from memory, and if I have forgotten anyone here, and throughout the festival, I apologise) Lisa, Alex, Katia, Richard, Greg, Lee, Jess, Kwenton, Dave, Paul and Rhett (@dialmformovies) and discussed films, movies and everything in between for several hours before calling it a night. Awakening this morning we thought we were destined to experience gloomy weather, but much to our delight, the sun began to shine. After checking out of the hotel, Sam and I were very organised in coordinating several trams and making our way out to Brunswick Street, Fitzroy. Cam and I had visited Brunswick St. on Thursday, but I thought it might be a nice spot to have some lunch with Sam before we headed back to Sydney. We had a nice coffee, browsed through some of the funky stores, but decided to return to the city for lunch. On the way we stopped into a store on Bourke Street we had passed the day before and I picked up a leather bag/satchel that Sam suggested I get. After lunch at Degraves Street, we caught the shuttle bus back to the airport, and after waiting about an hour there, boarded our flight back to Sydney. Though I would have loved to have stayed longer and watched more films, I felt ready to come back to Sydney. This trip was exactly what I needed. I required a relaxing break, and though the days were long and tiring, I saw some fantastic films and met some interesting and passionate filmgoers and writers. Overall, I could not have asked for a better MIFF experience and I will surely be back next year.